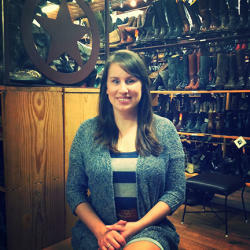 South Congress shopping anchor Allens Boots has been Austin&apos;s authentic western wear go-to since 1977. Peruse more than 4,000 boots representing 12 manufacturers (the largest selection of boots under one roof in the world!) at this handsomely rugged, essence of Texas retailer. What makes a great pair of cowboy boots? A handmade boot is always best. You simply cannot beat the fit of a handmade boot. Take Lucchese Classics or Old Gringo, for example. More than 100 hands touch the boot over the course of construction. Just look for the Big Red Boot on South Congress and you&apos;ll find Allens Boots. 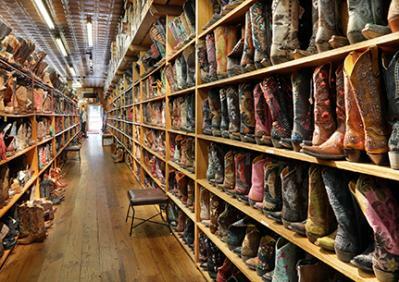 More than walls of Lucchese, Old Gringo, Frye and Justin boots, Allens also carries hats, clothing and accessories that span ostrich and goat belts, Texas belt buckles, wallets, clutches and totes. Discover additional authentic Austin shopping and stay up on the latest trends with Allens&apos; Boot Blog.